"Combining a chilling warning with a rousing call to action, feminist activist Sztokman (The Men’s Section) documents the places in Israel where “a radical religious misogyny has been gradually creeping into public spaces.” With outrage and bewilderment, she chronicles how Israeli business leaders, lawmakers, politicians, and police have caved to the demands of an ultra-Orthodox minority to remove women’s faces, voices, and even their physical presence from public venues, creating “female-free zones” in the name of modesty. She exposes the “entrenched culture of sexism” in the Israeli army and legislature, and explores how the Orthodox rabbinical courts cause disproportionate harm to women in their governance of “personal status” issues (marriage, divorce, and conversion), among other concerns." "A worthwhile and eye-opening study." "Sztokman's articulate call for attention toward and action on behalf of women's rights in Israel will be of interest to all readers with a passion for global feminism and Jewish women's lives. " "Sztokman approaches this complex subject by focusing each chapter on a specific aspect of gender discrimination in Israel today. In a conversational yet erudite style, she discusses the roots, mechanisms and consequences of topics such as gender-segregated buses, attempts to banish women's presence from the public eye (whether it be their faces from advertisements or their voices from official events), issues of women's 'modesty', official policies regarding sexuality and fertility...and women's service in the IDF. As the descriptions of institutionalized discrimination and injustice accumulate, she builds a powerful indictment of the increasing ultra-Orthodox hegemony over Israeli women's lives". "A glimmer of hope for religious women in Israel....In her book The War on Women in Israel: How Religious Radicalism is Smothering the Voice of a Nation, Elana Maryles Sztokman exposes many gendered issues within Israel, delivers a spot-on analysis of the underlying reasons for the inequalities, and proposes creative solutions to build a more inclusive society." 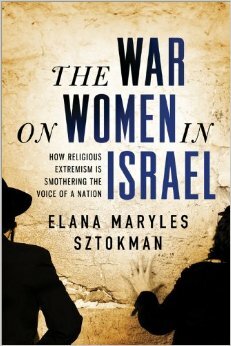 "Sztokman’s extremely compelling study of the marginalization of women uses Israel as its test case to prove how religious fundamentalism is more insidious than we can imagine. Left unchecked, it could turn back the clock for women’s rights the world over, and to the detriment of civil society as a whole." "An outsider reading this extensively researched review of the way women are treated in the modern Jewish State might think that the author was describing Alabama of the 1950s. With women segregated to the back of certain public bus lines; prevented from singing in the Knesset and banned from some official ceremonies; and forbidden to pray according to their beliefs at Judaism’s holiest site; it would seem that Israeli society is suffering from a severe case of gender discrimination"